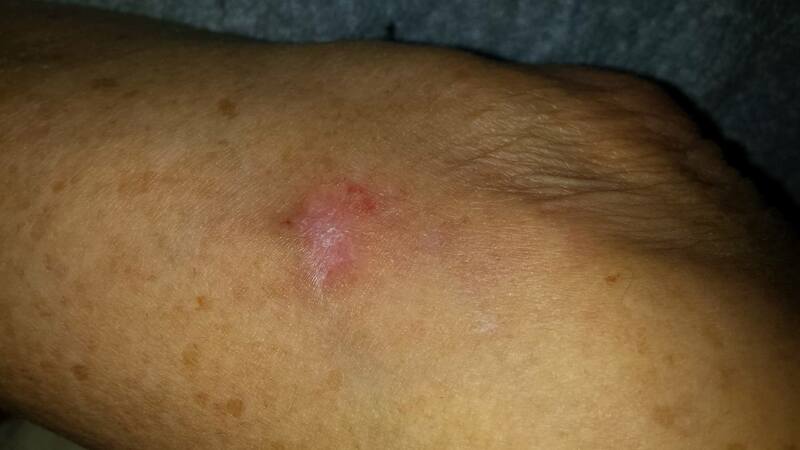 Wound care is simple, believe it or not. Infection sets in merely because an environment suitable to the sickness/bacteria is suitable for its existence. All one needs to do is shift the environment to that which the infection cannot exist and it dies. Very simple. 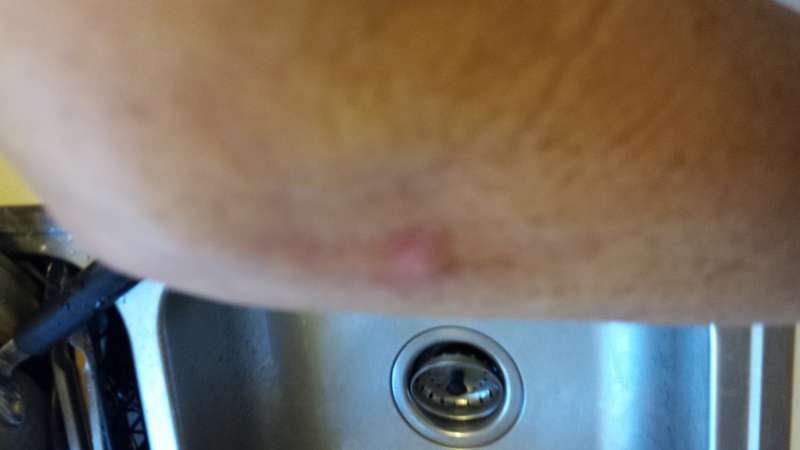 For years people have used hydrogen peroxide, alcohol, or whatever for wound care to clean wounds. This is clearly productive, meanwhile there is actually a far cheaper, more effective means to employ. It has been used for hundreds and thousands of years and has always been effective. It is employed by animals all the time. Our book, THE ANSWER TO CANCER: A SIMPLE SOLUTION FOR THE WESTERN CONDITION shares how to get started. Sickness (all sickness) and wound care is really very, very simple to overcome. As we demonstrate in the book there is a toxic gas/environmental issue that is common to all sickness. It is either the primary cause of the sickness or the secondary effect which causes the symptoms. All one needs to do is reconcile the body to eradicate the condition and sickness conditions flee. As a short time goes on the body becomes super efficient and it eradicates the root cause of the sickness. We started a very simple, herbal approach with this woman remotely with her at the end of a phone, or on email/Facebook treating herself. Her relief came in waves. It was very quick, very effective, and it actually addressed the problem (cause) not symptoms. The problem for this lady and most people is they think they should be pain free. Pain is not a bad thing and when understood it should be embraced. What one will find is that dead tissue feels no pain. Live tissue has no pain. Tissue transitioning between life and death experiences what we sense or call pain. In this light pain is much better to experience than an absence of pain. Get this straight. Pain management is killing more people than you can imagine. PAIN IS GOOD! PAIN TEACHES US THINGS ARE MOVING. PAIN MEANS THE LIFE/DEATH transition is moving! With this lady we purposely induced pain showing her what we are/were doing to drive out the poison in her system. She could see what was taking place and we used the pain reflex to monitor her performance. The approach outlined in our book immediately uncovered using “Bubble Diagnostics” (A chapter in the book) a staph infection (sepsis?) within her extremity. The reaction shown below was on one morning. 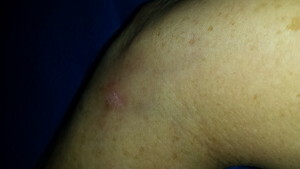 She felt a bump/lump formation, advised she had cold sensation in her hand, and pain in the arm. As our process began she got bruising around the area. 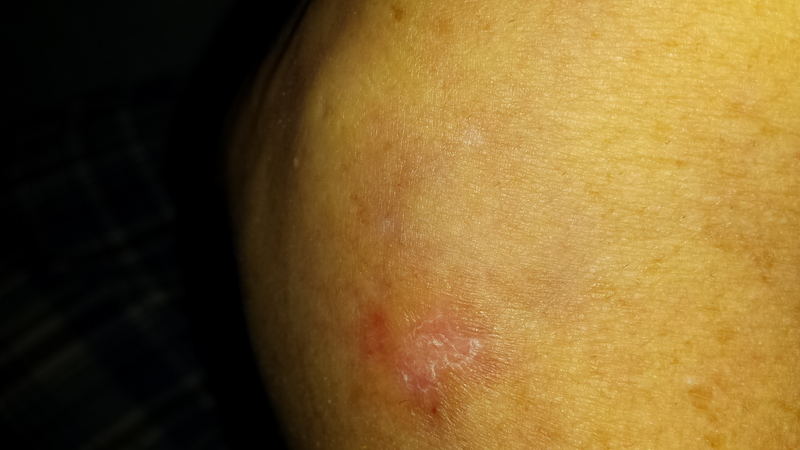 We were able to take away all the bruising within 2 hours using a compress approach we have developed. Understand the process of deterioration in her arm had been underway for over 2 years when we met her. The woman had multiple surgeries being scheduled. All of her doctors were calling for tissue biopsies. She had a colon cancer diagnosis. She was afraid. The doctors were chasing all kinds of things meanwhile they could not see the forest for the trees. 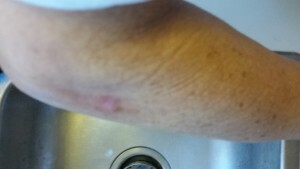 She had a septic infection (Staph) in her arm. 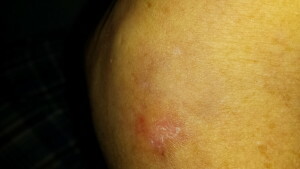 The infection in her arm was affecting (infecting) her shoulder and all things in that area. The majority of her conditions are/were all linked to this. Doctors often explore areas and things you cannot see. The remove biopsies from places you cannot see nor are aware. They send a sample you never confirm is yours to a place you cannot monitor. They come back and say a piece of flesh you donated has something you cannot understand. Promptly they recommend treatment you do not understand, and in all likelihood you do not need. You are operating in the dark with sole dependency on an information system that purposely keeps you in the dark. They operate on your fear, and most often folks with “good insurance” are diagnosed as it is easier for the doctor to get paid. Do you smell a rat? You should………..get our book. Get a copy of our book to everyone you know. Our book will allow you an early warning, early intervention system and it strengthens the body rather than weakening it. In the photos before a long standing problem is/was quickly identified using a $1 approach. The bubble diagnostics revealed the real problem and immediately went to work. The woman with the issue was somewhat distracted by fears from seemingly crooked medical practitioners. She might have gotten better, faster results if this had not been the case. Meanwhile our work with her helped her to see they had missed the forest for the trees. A simple $1 approach got the poison isolated and moving out of her system. There was a little pain, but likely less pain than what one would experience going through a needless operation. Meanwhile our approach focused on the real problem which was poison being released from a long standing infection. As infections go a vast majority are anaerobic in nature. A doctor has about a 10% chance of diagnosing an anaerobic infection if/when they know it to exist. Meanwhile, if they don’t know it exists, then guess what? They may never find it. Fight it always and you always win. This wound condition produced bruising which was taken away. The inflammation issue continued moving to the surface until it was reconciled. Once the actual problem was reconciled the body went on in similar fashion to address other sickness issues. As a “hedge” we spent $50-$100 in herbal ideas/approaches to boost the immune system. If the woman would quit having biopsies and listening to doctors, then she would likely be much better off.